The battle to preserve personal and secure data across mobile platforms goes on. You may remember that I went on an exploratory trip around every secure database system recently, with no satisfactory conclusion. Is it too much to expect to be able to take my PINs, my ID numbers, my software serial numbers, my secrets, from platform to platform? It may be too early to call off the search completely, but a solution is emerging that looks future proof and promising. 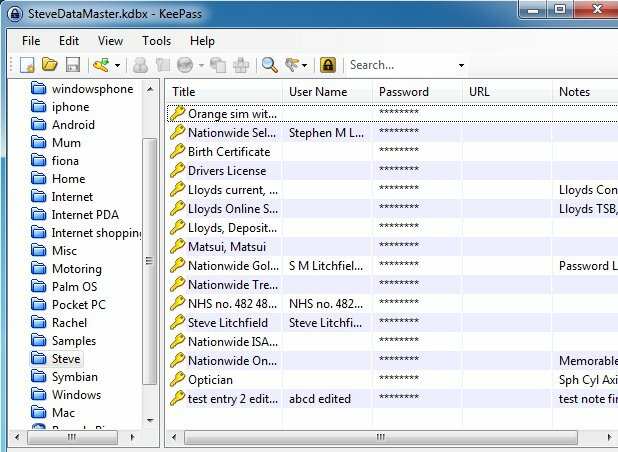 You'll probably be very familiar with the concept of a password manager - Lastpass springs to mind, a system for remembering the passwords you use on multiple web sites. But here I'm talking about a 'secure database'. So, yes, web sites are in the mix, but there's very much more than this. 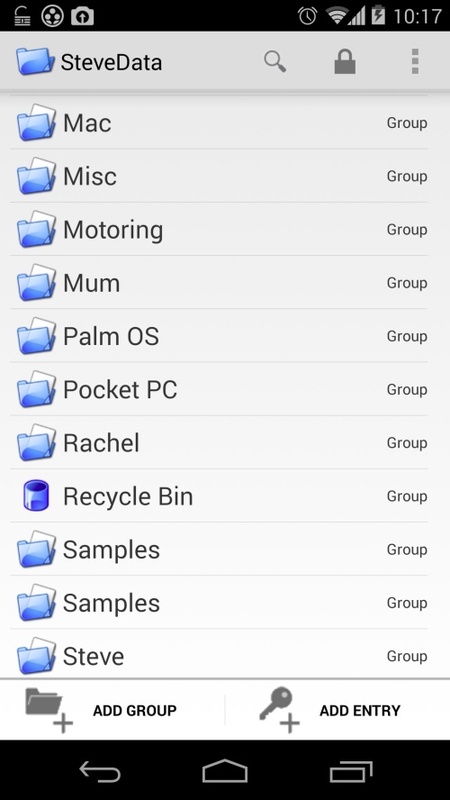 Almost 1000 entries in all, amassed over a decade in Handy Safe Pro, an application which started on Symbian, syncs to Windows PCs, and which has made tentative steps onto other platforms*. With this amount of information, you can see why I'm not keen to copy and paste individual fields and records into a new system, let alone re-type anything! Am I unusual in having this amount of 'secure' information? Quite possibly. But I'll bet that most people have some need for such a solution, even if they haven't got round to implementing it yet. * though which now qualifies as 'abandonware', as the developers (Epocware) have stated that the product isn't being developed any further. Now, my Symbian smartphone continues to largely work as advertised, so Handy Safe Pro (with the PC syncing) still fulfills its duty - entries can be modified on phone or PC and the changes get merged together. It's a wonderful system and it's no surprise that Handy Safe Pro is one of the biggest selling Symbian applications ever. Yet, with Symbian in its latter days, the time has definitely come to plan ahead. Now, as noted in the previous article, the import from my beloved Handy Safe Pro (via XML) wasn't perfect, though I did find that all data was preserved, even if the field structures for items didn't always match perfectly. But it was good enough, given the promise of versions for other platforms. 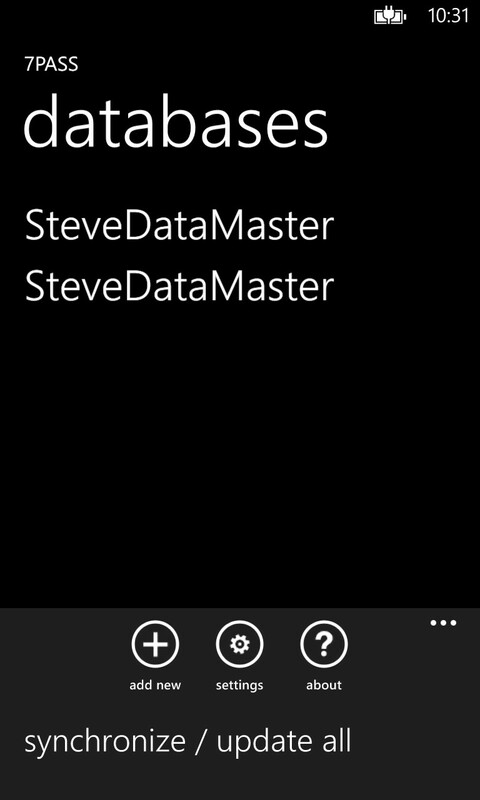 In this case, my goal was full two synchronisation from Windows AND Mac to both Windows Phone AND Android. And I almost got there, thanks to both the portability of Keepass's database files and the ubiquitousness of modern cloud file storage. NB. The desktop screenshots here have been deliberately done from scaled down windows for privacy reasons - obviously the applications on Windows and Mac screens can be taken much, much larger! 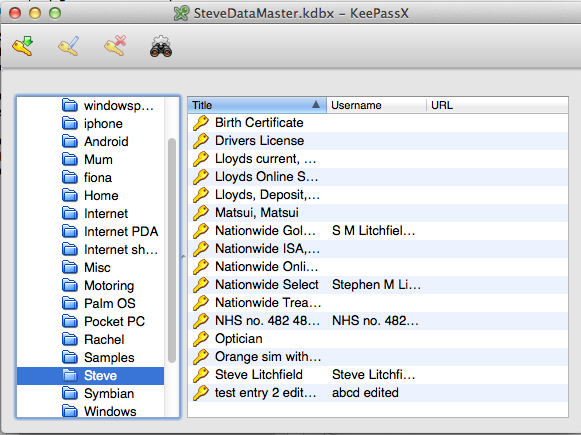 On my Mac, I used KeePassX, officially in alpha, but it seems to work fine. From the 'open' dialog, I simply pick the database from my synced Google Drive folder, enter my password and up comes all my data. On my Android phone (a Nexus 5), I use Keepass2Android Password Safe, which also takes the chosen secure database from Google Drive (this being a Google-based OS) and lets me view and edit entries again. When the database is closed, the file is synced back to Google Drive, ready for another platform or client to pick up. On my Windows Phone 8 device (a Lumia 1020), I use 7Pass, the only Keepass client I could find. Now, this application is clearly in flux, with the developer promising a new Windows Phone 8-optimised version soon (I wonder if the name will have to change? ), but there is some functionality here worth using. 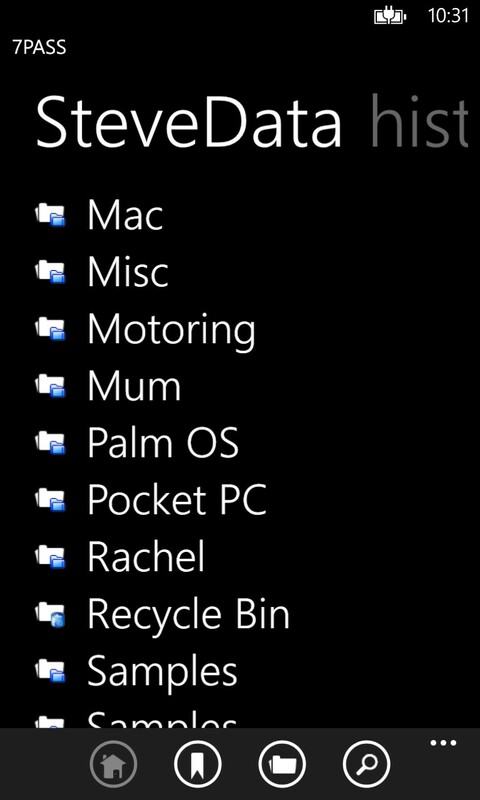 With no user file system in Windows Phone and with Google not providing hooks into Google Drive for other mobile operating systems, I couldn't find a way to get my master database from here into 7Pass (though GDrive WP7 looks promising for a moment). Perhaps not surprising, which is why I switched to experimenting with Microsoft's SkyDrive. At the Windows 7/8 end, it's easy to get a Keepass database synced up to my SkyDrive, from where 7Pass can download it directly. The application opens the database and allows both viewing and editing - but trying to use the synchronize option on the menu merely results in a duplication of the database (it's shown twice in the file list!) and there's clearly work here for the 7Pass developer to do. In summary, for Windows Phone, there's no conceptual reason why 7Pass or an application like it couldn't open from (and save back to) the Microsoft cloud in just the same way as happens with Android and Google Drive - the software just isn't quite there.... yet. So, I fully achieved my goal for Windows-Mac-Android, but only partially for Windows-Windows Phone. But hey, my data is at least available in one direction on the latter. It should be noted that for all this file syncing action, it's just that - FILE syncing. In order for the database to move around, the file has to be closed, and there's no concept of merging changes between two different versions of the file. In Handy Safe Pro, I could change entries on both the desktop and phone and it would all get sorted out at the next entry-level sync, but it seems that this low level flexibility may elude us for the time being in 2013/2014. In addition, I should also note that, skipping between platforms, you need to allow enough time for the Windows and Mac Google Drive and/or SkyDrive OS file plug-ins to do their thing, syncing the new version of the database up or down. Patience! I'll keep 'All About' readers informed of updates to 7Pass in the coming months, of course. Or perhaps a new Keepass client will emerge? Comments welcome if you want to weigh in with your own experiences here.